MediaCityUK creates a globally significant digital media hub. It is one of the UK’s largest construction projects and regenerates a former industrial dockside in Salford Quays. Gillespies developed an ambitious and creative response to the challenges presented by the site, with the aim of meeting and exceeding the aspirational objectives of the developer, the BBC and public sector partner bodies including Salford City Council, NWDA and GONW, who funded parts of the public realm. 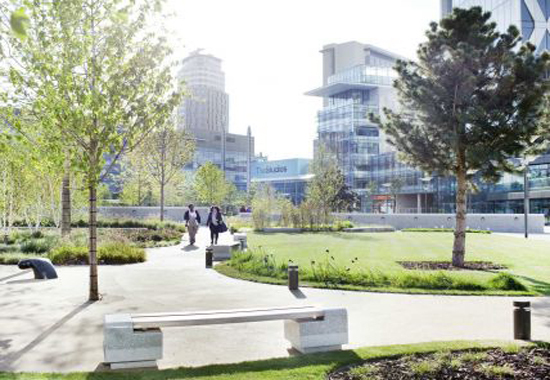 MediaCityUK has regenerated a formerly derelict brownfield site and transformed it into a high quality environment with an extensive array of public spaces. Gillespies’ design concept for MediaCityUK’s parks and public spaces was confident and contemporary. It drew inspiration from the rigidity of the site masterplan with its radial and concentric streets and its waterside location, which inspired a softer design response reflecting the ebb and flow of the canal. The industrial history of the area is not forgotten and construction materials selected across the development, including steel, natural stone and wood, reflect the former dockside character. At the heart of the new landscape is a multifunctional Piazza, with a radial geometry and elegant arrangement of natural stone paving that establishes a dynamic connection between the waterfront and the buildings. Its broad expanse serves as a function space for activities, media events and large gatherings and is enhanced at night by over 350 computer controlled LED up-lighters, creating a distinct night-time identity. Sitting in sharp contrast to the sleek lines of the Piazza is Media Park – the development’s green heart. 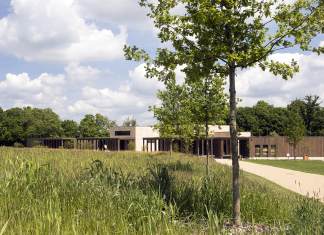 Here, rich naturalistic planting with timber decking and sweeping paths create intimate spaces for strolling, relaxing and creative inspiration as well as attractive backdrops for outdoor broadcasts. The formerly imposing Ship Canal dock edge has been stripped away to create a grand stepped terrace down to the water’s edge. Positioned next to a new tram stop this terraced waterside is multifunctional – it provides attractive waterside views, a gathering space for events and a landing place for water taxis. Design of all elements of the landscape and public realm for MediaCityUK, including new public spaces, a large piazza, landscaped parks, streets and a new waterside terrace on the former industrial dockside. By selecting predominantly native trees, shrubs, herbaceous, bulbs, grasses and wild flowers the number of native species across the site was increased, attracting many insects and birds. Some 215 new deciduous and evergreen trees have been planted. Because of the scale of the development many of these trees are semi mature size and, in addition to offering aesthetic and biodiversity benefits, also offer micro-climate benefits and were carefully located to offer local amelioration from the strong winds that affect some parts of the site. The landscape is designed for the pedestrian and has created one of the UK's largest shared surface environments where complete DDA compliance is achieved. By incorporating exemplary sustainable design principles, MediaCityUK is the first project in the world to become a BREEAM accredited Sustainable Community.